Don't forget that making the described changes to your USB flash drive may not only void the device's warranty but may also kill it. Experiment at your own risk! 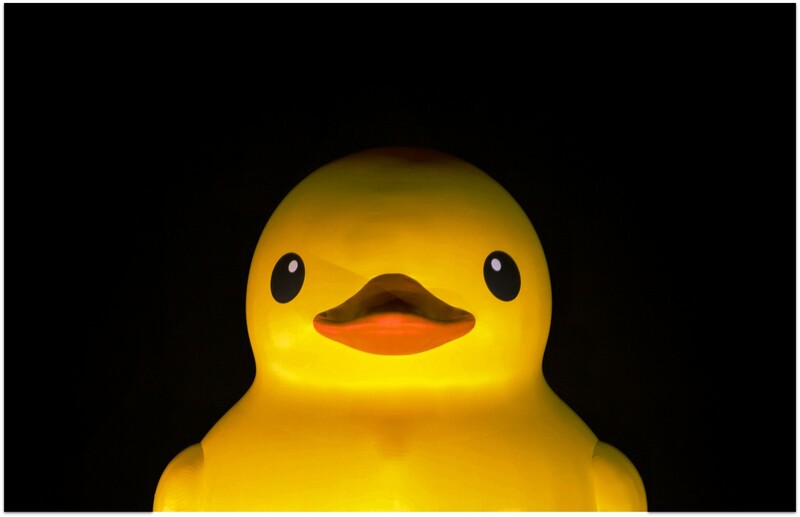 Last year's Black Hat was full of many interesting reports. One of the most discussed was a report on the fatal vulnerability of USB devices, which allows regular USB flash drives to be turned into a tool for spreading malware. The attack was called BadUSB, but later jokes appeared on the Internet referring to USBola, comparing this attack to the well-known virus. Similar ideas for using HID devices for malicious purposes have been around for a while. It's a sin not to use the fact that the OS trusts devices connected to a USB interface. If we search the magazine's archives, we can find an article on a similar topic describing the technique of using a special Teensy device to control a PC running Windows 7 (actually, with any OS). The device disguised itself as a regular USB flash drive. All this suggested that the same trick could also be played with flash drives. A USB is a really universal interface. Just think how many devices we connect it to and how many devices it works with! Mouses, keyboards, printers, scanners, gamepads, modems, access points, web cameras, telephones, etc. Without thinking, we plug the USB into the socket and the OS automatically determines the type of device and loads the required drivers. In fact, the OS knows nothing about the connected device. It has to wait until the device tells it what kind it is. Let's consider a simple example. When we plug a USB flash drive into a USB socket, the flash drive informs the operating system of its type and volume. It is worth remembering our shrewd Chinese colleagues, who learned how to produce higher capacity flash drives (some almost 2 TB). To figure out how this is possible, let's remember (or learn) how the OS recognizes USB devices. The purpose of USB devices is defined by class codes communicated to the USB host for installation of the necessary drivers. The class codes allow the host to work with single-type devices from different manufacturers. The device may support one or several classes, the number of which is determined by the number of USB endpoints. When connected, the host requests a range of standard details from the devices (descriptors), which it uses to decide on how to work with it. The descriptors contain information about the manufacturer and device type, which the host uses to select the program driver. A regular USB flash drive will have class code 08h (Mass Storage Device — MSD), while a web camera equipped with a microphone will have two codes: 01h (Audio) and 0Eh (Video Device Class). When connected, the USB device is registered, receives an address and sends its descriptor/descriptors to allow the OS to install the necessary drivers and send back the required configuration. After that, the host immediately starts working with the device. Once the work is completed, the device is de-registered. It is important to note that the devices may have several descriptors, they can also de-register and register as a different device. 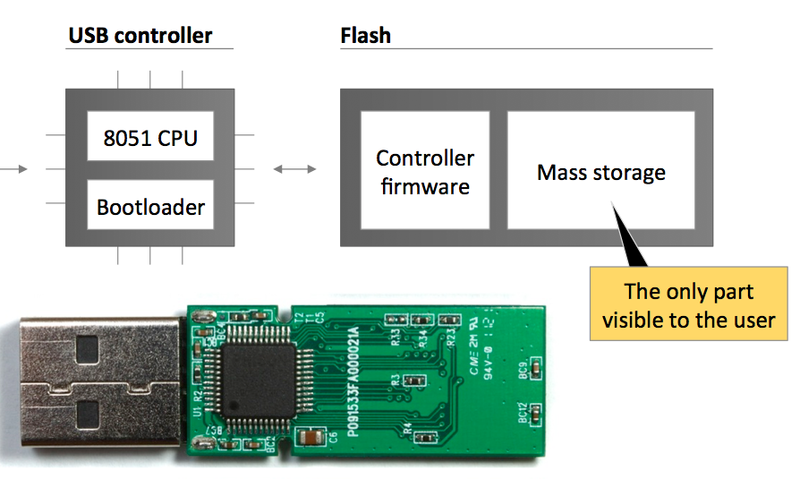 If you open the body of a USB flash drive, in addition to the mass storage visible to the user, there is a controller responsible for the above-described actions. 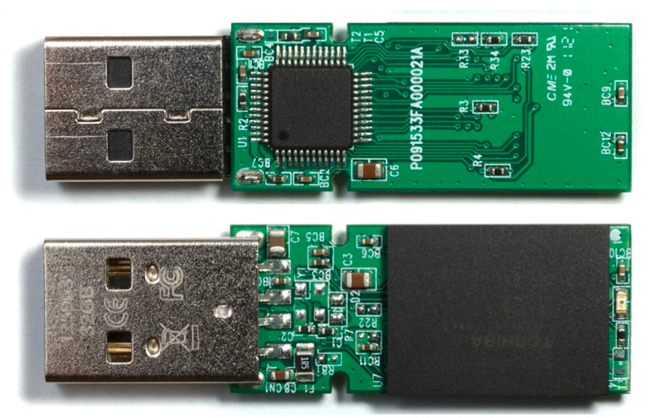 At the last year's Black Hat conference, two researchers (Karsten Nohl and Jakob Lell) shared their experience on how to install a personal upgrade to the firmware of the USB flash drive controller. After a while, this USB flash drive was registered as a keyboard and entered the selected commands. Due to the serious nature of the problem, the guys decided not to make the code for this available. However, soon after, two other researchers (Adam Caudill and Brandon Wilson) presented to the whole world at Derbycon conference an operable PoC tailored to Phison 2251-03 microcontroller The code is available at GitHub. As you might have guessed, today we will try to turn a regular USB flash drive into a pentester's secret weapon! First of all, we will need a suitable device. As the code has been uploaded for the specific microcontroller only, we have two options — either find a USB flash drive managed by this controller, or perform some very challenging work researching and upgrading the firmware of another microcontroller. This time, we will select an easier way and try to find a suitable USB flash drive (here is the list of vulnerable equipment). The controller is quite popular, so, miraculously, I found a suitable USB flash drive among the dozen I have at home.